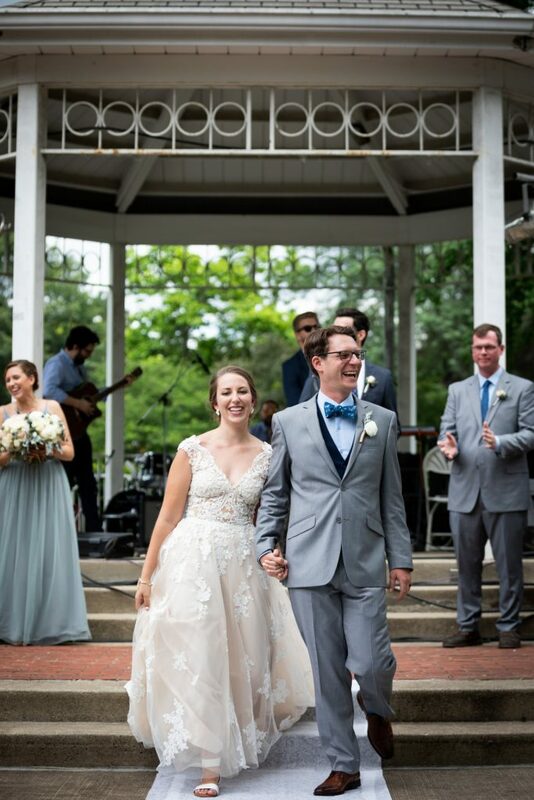 To Timothy and Melissa Wolf Starr, it was important that their wedding both showcased small local businesses and included one of their favorite Columbus pastimes, attending local festivals. 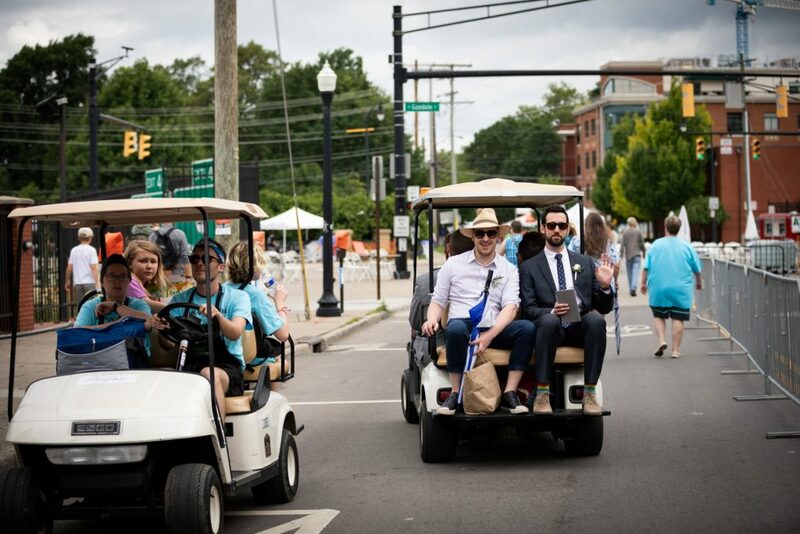 So they decided to get married at ComFest (naturally). 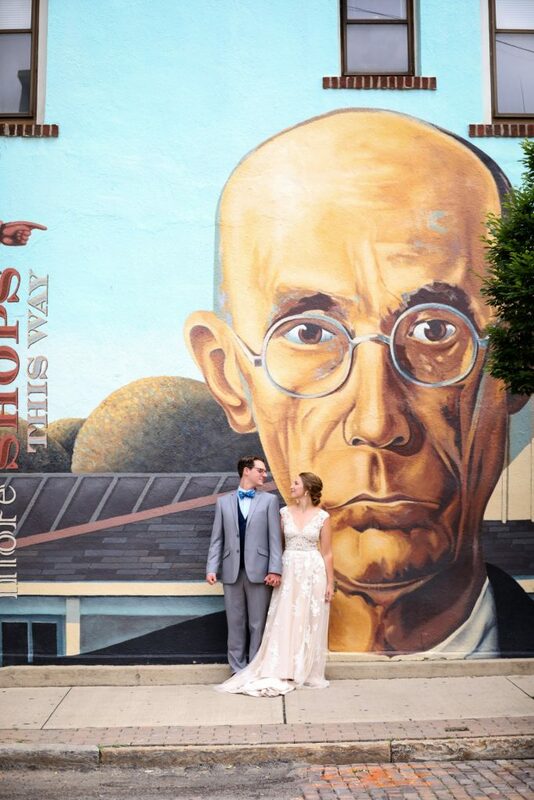 Although unconventional, the couple seemed to pull off their big day with beauty and uniqueness. 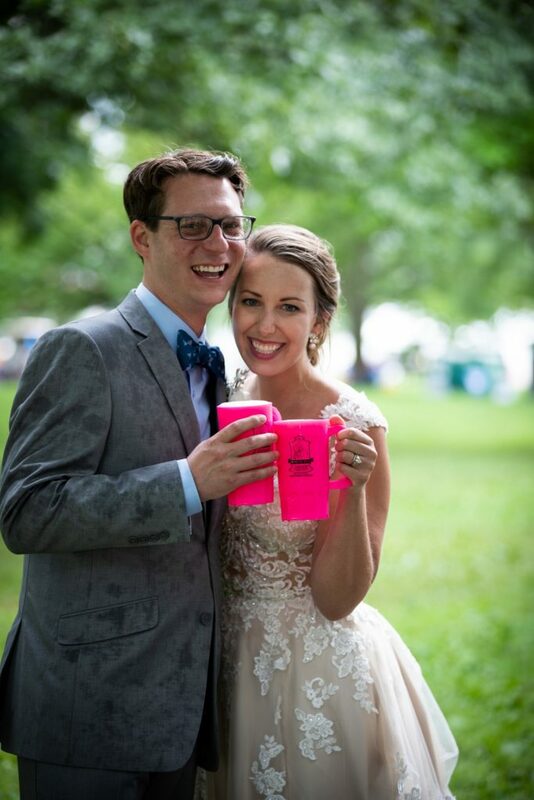 The couple designed custom mugs and food coins and pre-ordered beer tokens for their guests to use during their after-party within ComFest, allowing all their guests to “enjoy all that Comfest had to offer.” The food tokens were accepted by Mikey’s Late Nite Slice, Island Noodles, Paddy Wagon, Tortilla, and Two Fatt Indians. 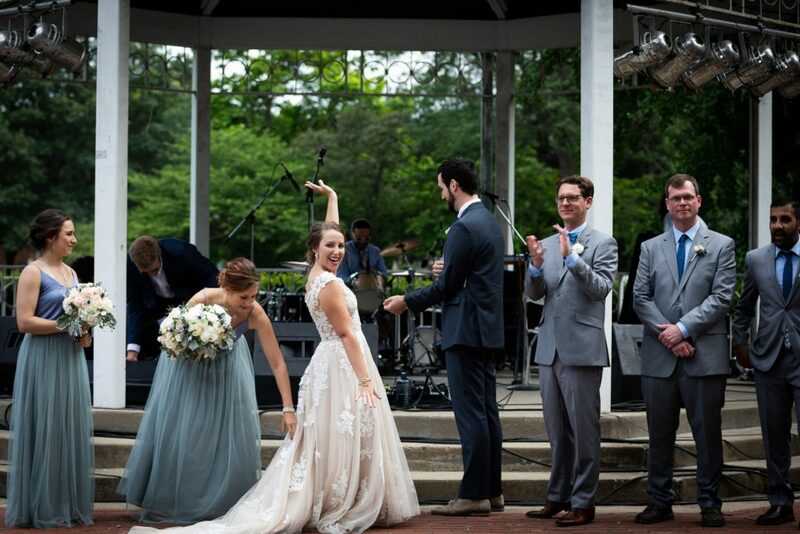 Timothy and Melissa walked down the aisle twice after being married, one of which was right before the group photo and went flawlessly and the other, before the after party, went a little less flawlessly (they had a trip-and-fall moment, captured perfectly in the following day’s Dispatch). Throwing a wedding in the middle of a crowded festival—that always gets rained out—seems like it may invite undue stress to an already stressful day, but the couple pulled it off with aplomb. 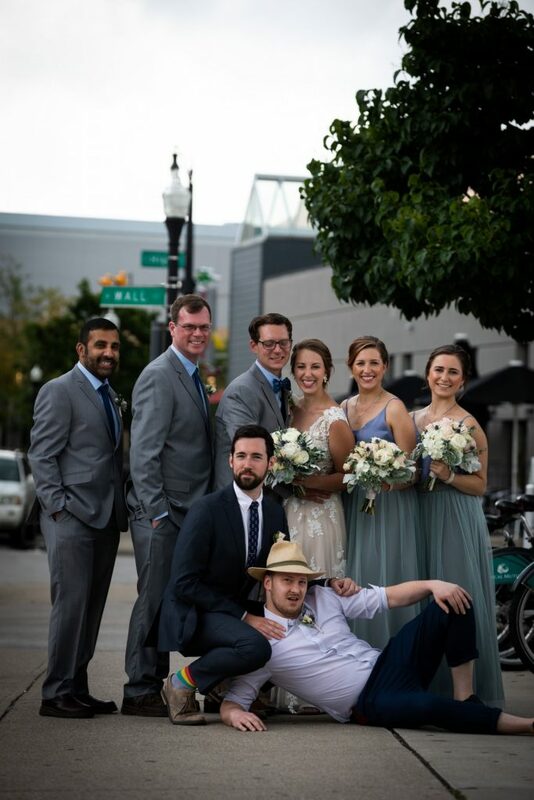 Plus, they got one of the best group shots in wedding history. Their Big Day was aesthetically pleasing and incorporated some of the wonderful aspects of Columbus: character, craze, and class. Who was someone that made your Big Day run smoothly or stand out? Our wedding boss Kelsi Rupersburg managed day-of logistics for our wedding within Comfest. Wonder woman. Our master of music Conner McClure coordinated with Comfest for a one-of-a-kind musical performance by Joey and The Jewelers prior to our ceremony. Transportation specialist Jacob Wooten skillfully provided golf cart pick-up-and-delivery Grandma service and “other assigned duties.” Nominated for an outstanding performance. 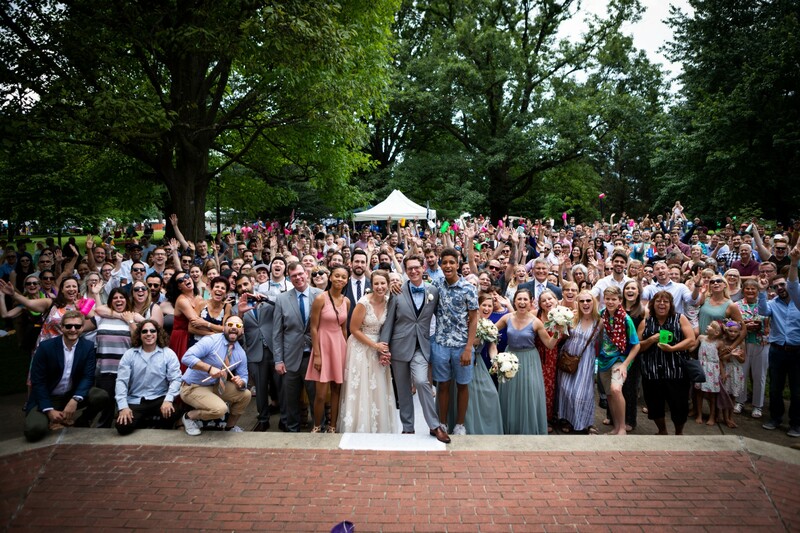 Candice Watkins and the whole Comfest board granted us the opportunity to make our Comfest wedding a dream come true! Any standout stories from that day, or something that you’d do over every time if given the chance?Our photographer, Emma, suggested we take a group photo after the ceremony. This was the best idea and one of our most favorite captured moments! Did anything go comically wrong, or was there anything you wish you had skipped? We had two trips down the aisle after being announced husband and wife. The first was before our group shot and the second was to lead everyone to our after-party. Round one was flawless, but in our second attempt, we had a comical trip-and-fall moment that left our guests gasping on either side of the isle. The Big Day, in six words: It took a village, called Columbus.